If you are interested in importing products from many suppliers in the Chinese market. The separate consignment is not good for you to manage shipping and it is costly, so you need China Warehouse & Consolidation Service. Freight consolidation is an effective ways to implement the cost-saving for manufacturers and importers. They pay lower shipping costs by using this service. Consolidated shipping is a freight consolidation service mainly provided by top freight forwarder. In this service, large quantities of goods are shipped in smaller volumes and further transported after assembly for better rates and safety of goods. There are two common cargo consolidation services in China’s exports. Carriers collect goods from several shippers. This is the concept of a carrier docking many shippers. A consolidator(usually a freight forwarder or carrier) concentrates the cargo of different shippers into one consignment and ship them to different consignees in the same destination. The goods can be transported in batches or merged into one batch with many shippers. If you need to ship a small quantity of goods by sea, you should use this mode of shipping. Use this mode of shipping if you need to ship a small quantity of goods. There are air freight consolidation and LCL shipping. Air freight consolidation. The air freight agent collect different shippers’ air shipments and deliver to the same destination. They share a main air waybill bill, and offer each shipper an air waybill bill. Freight forwarders can reduce the air freight cost by this way. It is cheaper to ship goods by sea freight than by air freight. In this case, you do not need to book a full container shipping for your goods because the minimum quantity is small. Besides, through consolidated shipping, shippers can enjoy lower prices and save costs. So LCL shipment is a typical cargo consolidation shipping. However, the strongest argument against this mode is that it take more the transit time. This method is to collect small batches of goods from several local suppliers in China and send them to the consignee. This is a “one carrier to one shipper” concept, but one buyer docks different suppliers. The process of this consolidation is that you send many parcels to a shipping company, and then they repacks the packages for you and ship them overseas. In the carriage of goods, the greater the volume of goods, the lower the shipping rates, thus prompting the enterprises to transport goods in large quantities. A good method to reduce the cost of unit weight transportation is to consolidate small quantities of goods for large quantities. Inventory comes from service requirements. This can be done by transporting large quantities of goods or even the entire vehicle freight transport, and converting them into inventory, which is the fundamental effect of inventory control. In order to improve efficiency, a vehicle can be arranged for loading and unloading at multiple locations when there is not enough cargo to be transported. Carriers have to plan the route and timetable to achieve this form of economies of scale . This applies to low-volume shipments. Warehouses around the world enable us to provide our customers with cargo consolidation and storage. After all, small-volume consolidation can help you eliminate unnecessary shipping costs. When it comes to storage, you can send all packages purchased from different vendors at once. We can guarantee the integrity and safety of your goods. Store the goods in the warehouse of the company for the fixed customer without any additional cost. In certain case, the enterprise will accumulate customer orders within a certain period of time, so that they can transport large quantities of goods at once, rather than many small batches of delivery. However, of course, due to the failed to fulfill order in time after receiving the order will cause a decline in service level. So, when choosing this kind of consolidation, we should seek a balance between shipping cost and service experience. 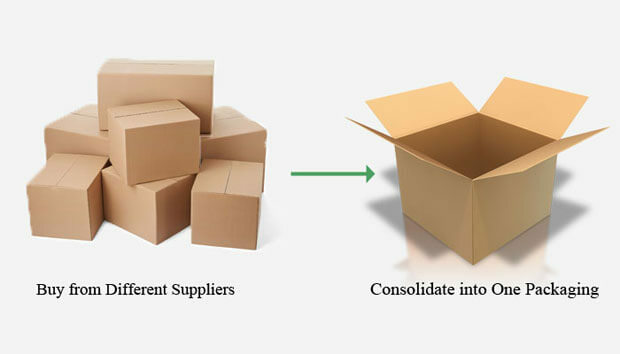 Why Consolidate Goods or Parcels? When forwarding many parcels of goods, you will ask for this service. This brings some benefits for you: ease, eliminating excess packaging. Besides, freight consolidation that centralizes many deliveries, reducing delivery costs. It is much easier track an international shipping parcel than tracking many. Besides, consolidated goods requires you to do a transaction with the customs without having to repeat the action. In a word, if you ship many parcels, you will takes you more time to deal with them. When you transports many parcels, you must expect to receive the goods at the same time. Even all parcels are being shipped at the same time, you rarely have the opportunity to receive them at a time. This means that you have to focus on these packages in a matter of days to weeks. Getting a consolidated shipping means you receive all the items. As we know, the consolidated shipment brings a lot of convenience, more important is to save money. Now, wherever you are in the world, you can buy products from Chinese stores and send them to your door without hassle. It is necessary to choose the best forwarding service and forward the package to you in the most smooth way. Package consolidating and forwarding services can provide many services. These services include commercial invoices, customs clearance, parcel repacking and goods consolidation. It is fast and reliable, providing you with value for money, fast and efficient service. You can perform any number of online transactions and securely store all parcels in the forwarding service warehouse until the parcels are forwarded to you. In many cases, freight consolidator can provide personal shopper services, especially when you are shopping in taobao.com, which is China’s largest online mall. When you have placed an order in TAOBAO, ALIEXPRESS, ALIBABA or other e-commerce websites. Then, the sellers will send to your designated forwarding warehouse, they can also integrate the package from different suppliers, sent to you by air freight within 5 days. They are experts in this field, their shipping consolidation service can meet your needs. Whether you like overseas shopping online, or are working on online sales, learn more about the Cross-border e-commerce logistics solutions. As most businesses are working with a consolidated freight forwarder, more and more people are starting to use their services. If you are looking for options using these types of providers, you can easily find one on the Internet. Consolidated shipping is a simple way to reduce shipping costs, especially when you are purchasing products from different suppliers. It makes your Chinese imports simpler and cheaper. Most companies around the world have the option to ensure the delivery of goods. They rely on these services to streamline logistics, minimizing costs and reducing transit time. This kind of good consolidated service can be obtained not only in China but also used for international transportation. Use this when shipping shipping from China, and you can save thousands of dollars in costs and expenses. Whether you are looking for a freight consolidation service, we can provide free warehousing winthin one month to store your goods in China. Collect your different cargo suppliers in China through our warehouse, store them, repack them and send them.